True love, is cancelling Valentine dinner at your favourite restaurant to sit together and kiss hot child skin, listen to coughs that sound like harbour seals. True love is taking your turn staying home from work, of getting one more cup of juice in the night, of laying close, sitting still, tickling arms. True love is doing the hard work of staying...of letting real life creep on all the edges of our tired thirties and choosing each other anyways. True love is after days of being so many things to so many people, we slow the pace. At the grocery store the other night we were hustling a little as the last flakes of snow fell. When I looked down at her, the big flakes had stuck in her huge eye lashes, her eyes closed, her chin tilted to heaven, her tongue out catching flakes. I stopped. I had nowhere I would rather be then RIGHT IN THAT MOMENT. 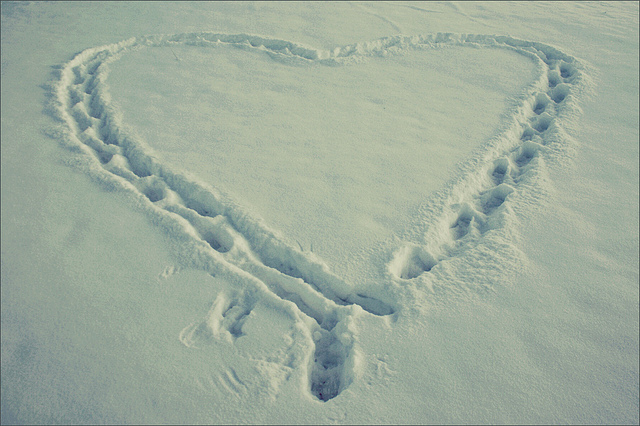 I trace out a heart with my feet in the snow, she opened her eyes, her face lit up, she makes a flower in the snow for me. True love is in the tiny moments…when we slow to the pace of little feet, take the time to let them stomp the cadence of a beating heart. Our days are full. I laughed at midnight last night when I was just starting to get somewhere on a paper due today. Working woman, hockey mom, dance mom, taught an evening workshop and THEN sat down to write. So many hats. I don’t mind being busy now and then, I get charged up on things, so excited to be a part of wonderful strands of life that God weaves together to make something beautiful out of our life. True love is never an outcome…it is the steady pace of goodness. He gets delirious the moment his body temperature inches over normal. Always panic and something scary. I pull him off that bunk, down into my arms, his limbs long over me. I rest my hand on his chest, heart is beating fast and hard, so near to me it feels it might burst through thin flesh. True love is the way of stretching beyond yourself, of inconvenience. True love is scattering keys to the captives, the speaking of hope when hope seems lost, the patience to try again. True love is the kindness in the face of all the worlds cruelty. Love is in the humility, the servant life of laying all the plans aside for the sake of another. Love is in the perseverance, the generosity. Love is in the passion. Sure. But that is the easy part. Love is the minuscule and marvelously small acts of a life layed down…that is what makes it true. Wherever you are today…single or in a relationship…what is it you can do to ensure your life is marked by these? This entry was posted in FAITH, Mamma Love, Marriage by melissafed. Bookmark the permalink. Melissa, this was beautiful. The world portrays “love” as a thing of passion and romance, and there is a time and place for that. But, as you have so wisely and eloquently said, it is so much more than that. It is a Savior. What I am doing to make sure that my life is marked by True love is keeping myself at the foot of the Cross, and firmly focusing my heart on Jesus. For only by seeing Him, and letting go of “me,” can I ever hope to love anyone the way I want to. Wishing you a Happy Heart Day – and hoping that everyone is getting better. Thanks Sharon! We are on the mend now I HOPE!! !